One hundred years ago, on the 28th of January 1919, four Russian Grand Dukes, all first cousins, were removed from their cells in the Petropavlovsky Fortress, taken to a courtyard, and summarily executed without a trial or conviction. Grand Duke Paul Alexandrovich (b. 1860), Grand Duke Dmitri Konstantinovich (b. 1860), Grand Duke Nicholas Mikhailovich (b. 1859) and his brother Grand Duke George Mikhailovich (b. 1863) were murdered in cold blood by their Bolshevik captors. In March of 1918, all male members of the Romanoff family remaining in the capital or its environs were ordered to register at Cheka headquarters, and were then sent into internal exile in other parts of the country. Because of his poor health, Grand Duke Paul Alexandrovich was allowed to remain with his wife under house arrest at his palace in Tsarskoe Selo. The Grand Dukes Dmitri Konstantinovich, Nicholas Mikhailovich, and George Mikhailovich were all banished to the city of Vologda, 655 km east of St. Petersburg. They were allowed to move in a fairly unrestricted manner in Vologda and visited one another with some frequency. The cousins remained fairly undisturbed, despite their informal confinement, until the summer. On 13 June 1918, after the execution of Grand Duke Michael Alexandrovich the younger brother of the Emperor Nicholas II, the guards at Perm are recorded as having noted that they believed that Grand Duke Michael had been laying plans for an escape or may have been attempting to coordinate a rescue effort. Whether this was true or not, the Bolsheviks used the incident as a pretext for issuing orders for the full imprisonment of the remaining Romanoff males as enemies of the state. Grand Dukes Dmitri, Nicholas, and George were arrested at Vologda on July 1, 1918, and were returned to St. Petersburg under arrest and placed in the Shpalernaia Prison where they would remain for most of their incarceration. Grand Duke Paul Alexandrovich, despite his failing health, was similarly arrested on 13 August, and also transported to Shpalernaia. Each of the Grand Dukes was kept under miserable and inhumane conditions, in cells measuring only 7 feet by 3 feet. While they were permitted limited exercise, the cousins met infrequently in the exercise courtyard, and were permitted to exchange a few words with one another. While the families of the Grand Dukes tried every measure to gain the release of their relatives, all attempts came to naught. “I went into the office. To the right, on the couch, a prisoner and his wife were seated; to the left, on two chairs, were another couple. At the further end of the room, near the writing table, was Comrade Schinkler.' I shall never forget the look of that man; he had the eyes of an assassin. A round face, clean-shaven, curly hair. Since the Bolshevists had usurped power he had arrived from America where he had lived during the Tsardom after escaping from a convict prison. I greeted him on entering, but he did not greet me in return. I showed him my document. "It is extraordinary how generous they are with these permits," he laughed mockingly; "if that were left to me -"
"Bring in the prisoner Romanoff." At the end of ten minutes the Grand Duke entered. We seated ourselves a little to one side. I spoke to him of the children and of the house; I questioned him regarding his health, etc. I noticed that Comrade Schinkler never removed his eyes from us. Suddenly he took a chair and planted himself down between us. "I have the right to know what prisoners are talking about," he said. "Now talk! " I noted a look of anger in the Grand Duke's eyes - I pressed his hand. Other relatives tried desperately to assist the four Grand Dukes. Grand Duke George Mikhailovich was able to write his wife in Great Britain, and she had urged Queen Alexandrine of Denmark, his niece, to try to intervene with the help of the Danish ambassador. On the 27th of January, the Grand Duke Paul was awakened and transferred from his prison hospital bed to the Gorokhovaya Prison where he was kept until 10 pm, and thence driven to the Peter and Paul Fortress. By 11:30 pm the same night, Grand Dukes Dmitri, Nicholas, and George were awakened in their cells at Shpalernaya Prison and taken to meet their cousin. 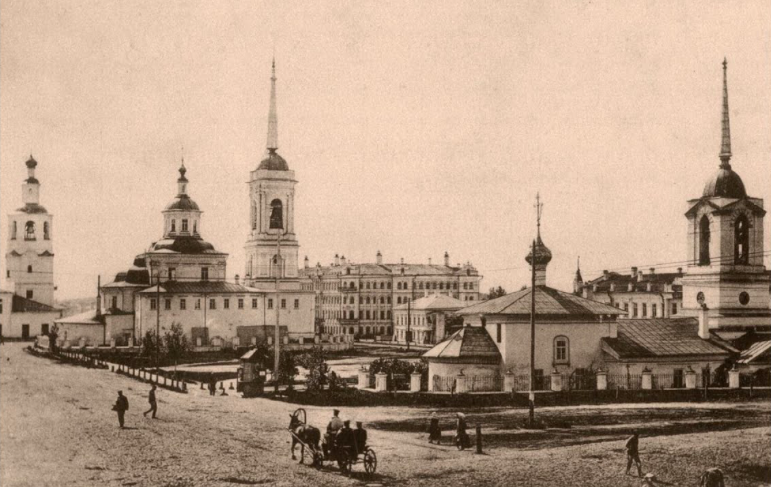 The four Grand Dukes met for the last time at the Peter and Paul Fortress and were taken to the Trubetskoy Bastion where political prisoners were held. They were stripped of their coats and shirts, and force to line up along the edge of a ditch which had been dug across from the cathedral in the square in front of the State Mint, where they were summarily shot -- the Grand Duke Paul still on his hospital stretcher. The execution of the Grand Dukes was announced on 30th January in Pravda, and the mass grave lay undiscovered and undisturbed for many decades. The Square in front of the Mint (Монетный двор), or “Place de la Monnaie.” The Cathedral of Peter and Paul is at right. In 1981, Grand Duke Paul, Grand Duke Dmitri, and Grand Duke George were canonized as New-Martyrs of the Russian Orthodox Church Abroad. Grand Duke Nicholas Mikhailovich was not canonized due to his well-known involvement with Masonry and radical politics. In 2004, a commemorative plaque was placed in the Grand Ducal Mausoleum of the Cathedral of Sts. Peter and Paul. In 2009, during internal construction in the Peter and Paul Fortress, nine unmarked graves were discovered containing a total of 112 remains. It is hoped that one day, DNA testing will identify the remains of the four Grand Dukes as well as the others murdered by the Bolsheviks in the days of the Revolution and Civil War. To the Grand Duke Nicholas, Eternal memory! Holy Imperial Martyrs Paul, Dmitri, and George, pray for us!